When we think of working our abs, we often imagine lying down on the floor, performing crunch after crunch after crunch. However, traditional crunches are not necessarily the best way to get that toned, trim mid-section you’ve always wanted. Here, we show you how 10 crunch-free exercises to tone your tummy. Planks strengthen your upper and lower abs, lower back and glutes. 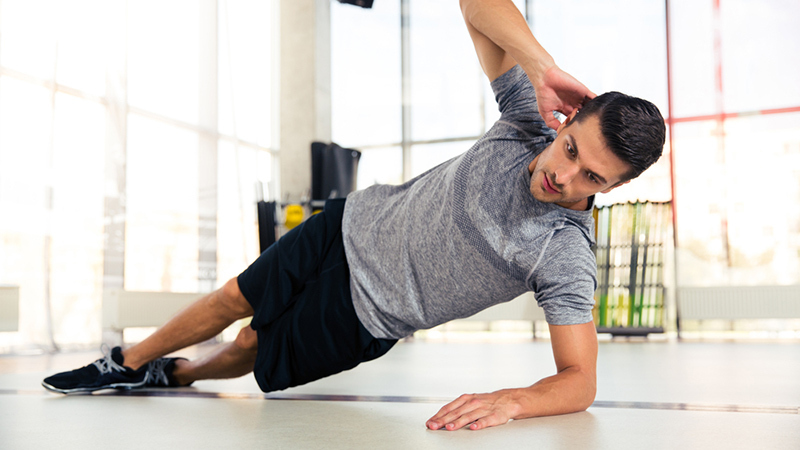 Begin in a push-up position, but rest on your forearms rather than your hands. Keep your shoulders aligned with your wrists. Engaging your abs, straighten your body so that your feet, hips and head are all in alignment. Hold for 10 seconds to two minutes depending on your fitness level. This variation intensifies a traditional plank. In the plank position, rotate your body to the left, lifting your arm up and keeping your hips up off the ground. Hold for 20 seconds. Return back to centre and do the same on the other side. Proper form is crucial, so aim to keep your body straight as you twist. Start with 10 twists and work your way up as you get stronger. Position your body in a V-sit, with your legs up and bent, ankles crossed. Hold a five-pound dumbbell or medicine ball and rotate the ball and torso to the left, back to center and to the right. To increase core flexibility, tap the ball on the ground with each twist. Keep your feet up and legs steady during this move. Do three 15 rep sets. This is one of the best core exercises for your lower obliques. Lay on your back with knees up and your hands supporting your head and neck. In one smooth movement, raise your shoulders off the ground while straightening out your your legs to a 45-degree angle. Keep your arms straight behind your head, so your body from a V shape. Be sure to keep your lower abs engaged as you keep your balance. Hold for 3 to 5 seconds. Do 10 to 15 reps for 2 sets. Get on all fours, resting on your forearms and your shins. Bring your left knee up to your chest as if you were touching your chin with your knee. Now kick that leg straight back, keeping your foot flexed and squeezing your glutes. Do this in one smooth motion – no jerking. Don’t raise your back foot any higher than your hips. Do 8 reps on each leg. Lie down on your back, hollow out the lower abdominals and float your legs up with your knees bent. Holding a 3-5 pound dumbbell, extend your right leg to a straight 45-degree angle (same as V-sit). With your shoulders off the ground, twist toward your bent left leg so that the dumbbell is on the outside of that leg. As you twist to the other side, bend that leg and touch the dumbbell on the outside of that leg. 8 reps on each side 4 times a week you will see noticeable results in 3 weeks! Sit on a stability ball, walk yourself forward until your shoulders are on the edge of the ball and place your hand behind you for extra support. Feet should be hip-width apart. Take one hand behind the head and left the opposite knee up. Crunch like an oblique twist, and lay back as you straighten the leg out. We borrowed this core muscle exercise from the yogis. In a seated, cross-legged position, place your hands felt on the ground in line with your hips. Straighten your arms and lift your body off the mat. Hold for a count of 3 and lower yourself back down. For beginners, try leaving your feet on the mat and raise just your hips. As you get stronger you can advance to the full move. Three reps is plenty with this killer move! Sit up nice and tall, feet flat on the mat. Take your hands underneath your thighs, hinge back, scoop in those lower abs and lift your legs up so that they’re parallel to the floor. Release the legs and stretch the arms towards the toes. Get into a V position, hands holding the backs of your bent knees. Hold for eight breaths and do two more sets. 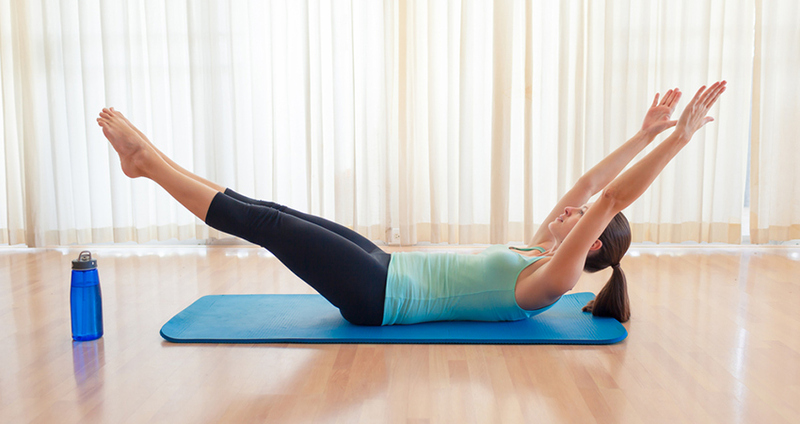 Lay on your stomach and reach your arms out overhead and point the toes. In one smooth move, “swim” your arms back to your sides while lifting your legs and chest 3 to 6 inches off the ground. Hold for one breath and relax. Repeat for 6 to 8 reps.
There’s a lot more to building core strength than mere crunches. Make your core workout significantly more effective and efficient with these 10 core shredding, crunch-free moves. Aim to work your core three to four times per week with a rest day in between for optimal results.